Supposedly a letter from Boki to someone in Britain reporting some general news from Hawaiʻi, and emphasizing that Rev. Hiram Bingham is wanting to exercise total control over the Hawaiian people, something he firmly opposes. Boki denies writing this letter. 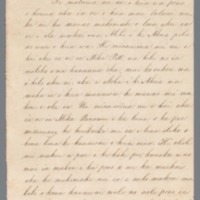 Awaiaulu , “Boki - Ali`i Letters - 1826.01 - to unknown recipient ,” Hawaiian Mission Houses Digital Archive, accessed April 25, 2019, https://hmha.missionhouses.org/items/show/2665.